Whenever we give anything in charity, whenever we are generous, we don’t receive the same in return – we receive so much more. Our reward is multiplied. Additionally, during the holy month of Ramadhan, every time we do a good deed, its reward is multiplied. We don’t receive just one reward for each deed – we receive so much more. Our reward is mutiplied. So then imagine how many rewards we would receive for charity, which is already rewarded so highly, during the month of Ramadhan, in which the rewards of all good deeds are multiplied. SubhanAllah! 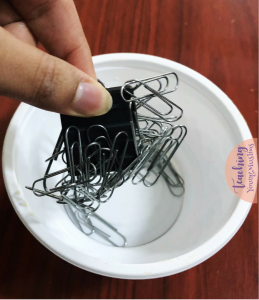 I wanted to discuss this with my daughter in a visual and hands-on way – so I decided to present this concept to her using a magnet and a bowl full of paper clips. 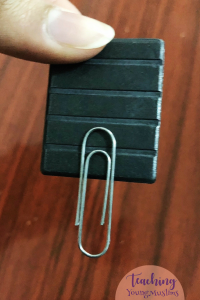 To start, I presented my daughter with a paper clip to represent a single good deed. I then told her that Allah (SWT) doesn’t reward us with just that one paper clip though, during this month of Ramadhan. I handed her the magnet and told her to place the magnet in the bowl and see what happens. When she placed the magnet inside the bowl, she was fascinated to see that so many paper clips were attached to the magnet. We would receive THAT many rewards! The reward that we receive for each deed is multiplied. This activity works great for charity as well. When we give a certain amount in charity, a single paper clip, Allah (SWT) does not reward us with just that amount back. He multiplies our reward. Again, by placing the magnet inside the bowl of paper clips, we were able to visualize that for every good deed, we receive a reward equivalent to how many paper clips stuck to the magnet. I LOVE how well this visual works for both concepts – and the visual can be used for either activity on its own, or the activities can be combined, if you feel the kids are ready for both concepts at the same time. Isn’t it amazing how much reward we receive for each deed during this beautiful month?! I hope you all have a blessed and beneficial month, filled with lots of good deeds – and lots and lots of reward for those good deeds!